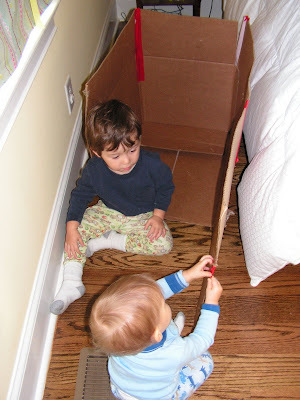 I gave the boys a box awhile ago that they have thoroughly enjoyed playing in separately and together. I had great plans to cut windows in it, paint it and make it more of a "play place." They don't seem to mind what it looks like. Jonas is getting old enough now to interact more with Asher. It has been fun to watch them play together and enjoy each other's company. 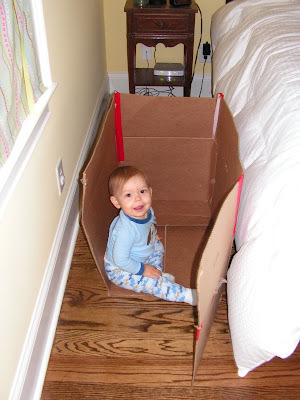 Oh, how I love the simplicity of this toy...a cardboard box! Please feel free to share simple toys around your house that you have created. posts EVERY DAY! Good job!!! I love this post! 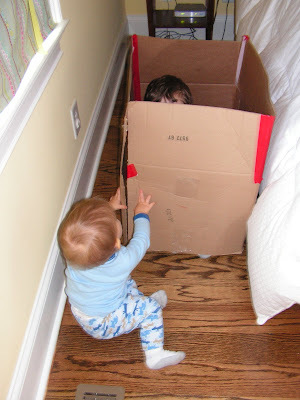 We've been playing with a certain cardboard box around our house too. Elijah has taken markers and stickers to it, and he adds to it daily. It's becoming quite pretty!